Product prices and availability are accurate as of 2019-04-18 11:03:59 BST and are subject to change. Any price and availability information displayed on http://www.amazon.co.uk/ at the time of purchase will apply to the purchase of this product. 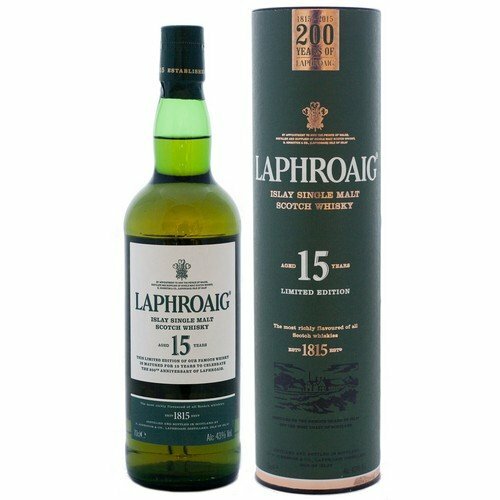 Bottled to commemorate the 200th Anniversary of Laphroaig - 1815-2015. It is truly something to savour - with good friends if you are feeling generous. A touch of water releases salted caramel, with signature Islay peat smoke underlying sweet orchard fruit aromas. NOSE: Scents of grapefruit and fresh mint greet you when you first open the bottle. PALATE: The first taste is of pink peppercorns with light peat smoke and a soft dryness that resolves to the flavour of tobacco. Just a faint hint of the sea follows, testimony to 15 years of maturation next to the Atlantic Ocean. FINISH: The prolonged mellow finish, with a smoky aftertaste will ensure your experience is fulfilling and unforgettable. Distilled at and bottled by Laphroaig Distillery.